Just before 2:30 a.m. EST Thursday, NASA astronaut Scott Kelly landed at Houston’s Ellington Field, marking his return to the U.S. following an agency record-setting year in space aboard the International Space Station. 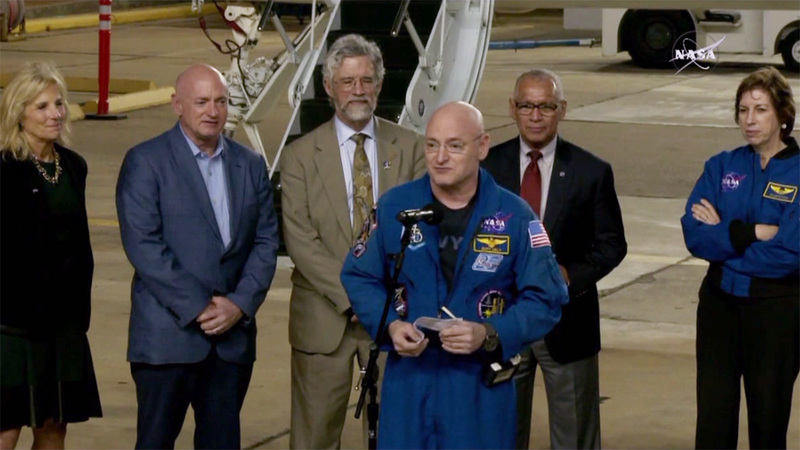 Those on hand to greet him in Houston included Second Lady of the United States Dr. Jill Biden, Assistant to the President for Science and Technology Dr. John P. Holdren, NASA Administrator Charles Bolden, and Kelly’s identical twin brother and former NASA astronaut Mark Kelly. Scott Kelly returned to Earth March 1, along with his one-year mission crewmate, Russian cosmonaut Mikhail Kornienko, and cosmonaut Sergey Volkov.